4 x large radius left hand. 1 x large radius left hand curved. 2 x large radius right hand. PECO SL-110. Also fit code 70 & code 83. 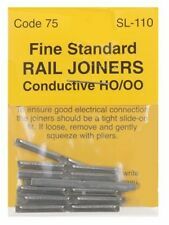 Bullhead Rail Joiners. PECO SL-114. 1:76 OO SCALE. Make Supersized Seem Small. Our Code: PESL-113. Part Number: SL-113. We will always help you to have a 100% positive happy buying experience. Scale / Type: OO Scale. Add to favourites. 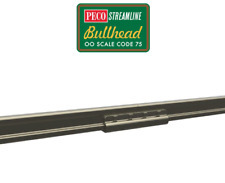 Peco SL-108F Streamline Bullhead Flexi Tack 914mm OO Gauge. Used model railways & collections always wanted. How it started; I have been interested in model trains since I was a child. It was more fun and much cheaper, now I can fix most locos so they run like new. SL-E180 X2. SL-E199 X6. SL-E194 X5. SL-E195 X3. SL-E193 X6. SL-E197 X3. SL-E188 X5. SL-E186 X1. PPeco SL-E189 OO/HO Left Hand Large Radius Turnout code 75. Electrofrog all working. 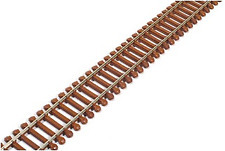 Peco SL-108F - Bull Head Streamline 00 Gauge Flexible Track Code 75 N/Silver 36"
5 out of 5 stars - Peco SL-108F - Bull Head Streamline 00 Gauge Flexible Track Code 75 N/Silver 36"
3 product ratings3 product ratings - Peco SL-108F - Bull Head Streamline 00 Gauge Flexible Track Code 75 N/Silver 36"
Peco SL-E187 OO/HO Left Hand Curved Turnout code 75. Our Code: PESL-114. We will always help you to have a 100% positive happy buying experience. ( PECO STREAMLINE CODE 75 NICKEL SILVER ). Here we have a Peco SL-E193 HO/OO Gauge Code 75 Short Crossing. and A SL-185 Left Hand Catch Turnout. Peco SL-E188 Large Radius Right Hand Electrofrog Code 75 Point. Condition is New and unused. Dispatched with Royal Mail. These shorter joiners (just over 5mm in length!). Peco SL-E192 Streamline HO/OO Finescale Code 75 Small Radius Left Hand Turnout . Condition is New and unused. Dispatched with Royal Mail. Postage combined on multiple items. Used model railways & collections always wanted. Bullhead profile nickel silver rail. How it started; I have been interested in model trains since I was a child. It was more fun and much cheaper, now I can fix most locos so they run like new. 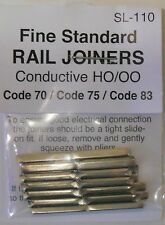 SL-110 Peco Rail Joiners, nickel silver, for code 75 rail 00/H0 (Pk24). Used model railways & collections always wanted. HS1-9, IV41-53, 55-56, KA27-28, KW15-17, PA20, 41-49, 60-78, PH42-44, ZE1-3 (48-120 Hours subject to ferry schedules and weather) Up to 20 kilos £25.99. 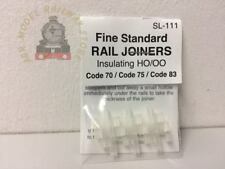 Insulated rail joiners code 75/83 (x12). PECO LK-156. Loco Inspection Pit for Code 75.